Scotts Field Roast Pork is like the Sunday lunch your granny used to cook! Over the years we have forgotten what ‘proper pork’ tastes like – after your first Scotts Field Roast you will remember! Our meat is not as lean as modern pork, it has a completely different taste and texture, is tender and easy to carve. Today a there is a lot of discussion about getting the perfect crackling. Can I let you into a secret? If you buy old fashioned pork there is no secret. Providing you ensure the meat is dry and start cooking it at a high enough temperature either on a rack or in a shallow roasting tin, perfect crackling just arrives, every time! The following recipe is based on Delia Smiths’s complete cookery course. I find that you can very rarely go wrong with anything if you follow Delia! Make sure your joint of pork is dry – take it out of it’s plastic wrapping as soon as possible after purchase. At the last minute and If you wish, rub the scored skin with salt (normally I don’t bother although the experts say you should) Put the pork in the oven, on a rack in a roasting tin. I sometimes add an onion to the tin. This adds colour and taste to the gravy. After 20 minutes turn the oven down to 190/375/gas mark 5 and cook for about 35 minutes to the pound. Timings will need to be adjusted slightly from oven to oven. A great tip from Elizabeth David is to add a cox’s apple per person to the rack about an hour before serving, you will end up with individual portions of apple sauce. 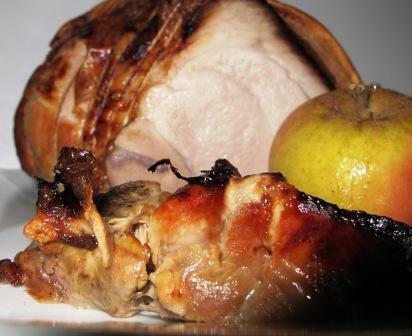 Once the pork is cooked, the juices will run clear, remove from the oven and leave in a warm place to rest for about 20 minutes. Remove the onion and excess fat from the roasting tin, add flour, veg water and if you wish some wine to make fantastic gravy. Serve with roasties and lots of veg and bread and butter pudding to follow! In the summer when it is hot or there is no time for a leisurely lunch I serve roast pork with salad and new potatoes or couscous. It is a lot easier than a BBQ and just as delicious. If you have a favourite Scotts Field Pork recipe please let us know – we would love to hear from you.